John Wetherill, "Hosteen John", was well known as an frontiersman of the Four Corners region. His career in that country spanned more than fifty years, from his early involvement with Mesa Verde in Colorado to his many explorations in the Navajo Country of Arizona, Utah, and New Mexico. John was born in Kansas in 1866. His parents were Quakers--his father, Benjamin Kite, from Pennsylvania, and his mother, Marion, from Iowa. The family's western migration eventually landed them in Mancos, Colorado in 1880. There, in addition to ranching and farming, John and his brothers began their explorations of the Southwest, beginning with nearby Mesa Verde. In 1896 John married Louisa Wade. Four years later they left Mancos with their two children for the Navajo country of New Mexico. There they made a living running trading posts at Ojo Alamo, Chavez, and Chaco Canyon and guiding travelers through the country. In 1906 they again moved--this time to a remote region of southern Utah where they built their own trading post. The location was Oljato, or Moonlight Water, seventy miles from their closest Anglo neighbor. They made Navajo and Piute neighbors, however, with whom they made lifelong friends. It was from Oljato that the 1909 discovery expedition to Rainbow Bridge embarked. Numerous other trips explored the cliff-dwellings and geological wonders of places such as Tsegi Canyon, Tsegiotsosi Canyon, Monument Valley and Navajo Mountain. In 1910 John, Louisa, and their partner Clyde Colville, moved their operation about twenty miles south to Kayenta, Arizona where they lived until their deaths in the 1940s. Hosteen John's legacies are best explained in the words of those who knew him. 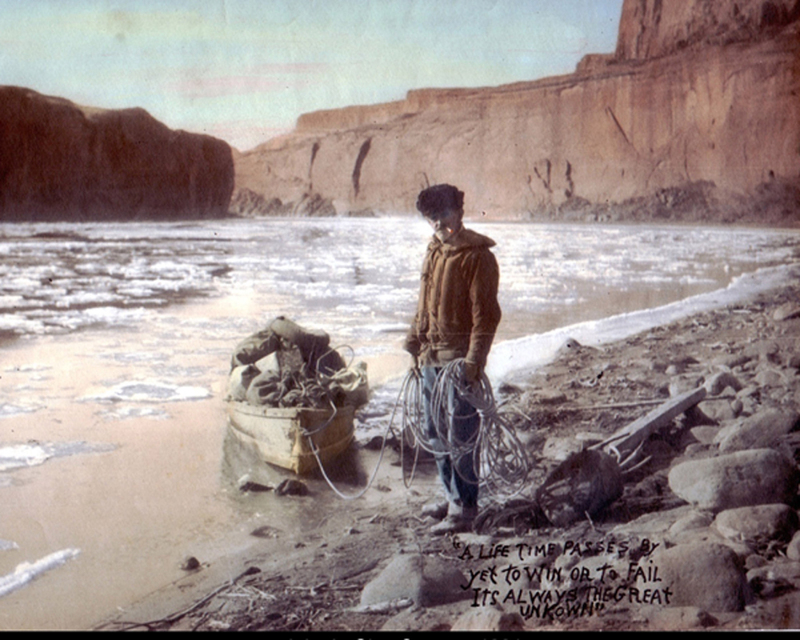 Most common are accounts of his exceptional backcountry skills which have been recalled by many of the archaeologists, geologists, and tourists who utilized his services to explore the remote and little-known canyons of the complex Navajo Country. Photographer Grace Hoover, who participated in the Rainbow Bridge-Monument Valley Expeditions in the 1930s said, "...we are immensely privileged to know John Wetherill, first white settler hereabouts. As advance crusader for the knights of the trowel and brush, he is still exploring, still guiding the wayfarer to remote wild parts of this exciting land..." To John's admirers he seemed the quintessential explorer of the early Twentieth Century. Noted Harvard anthropologist Clyde Kluckhohn wrote: "For frontiersmanship in that region I don't think anyone can be compared with him; for endurance only Dean Cummings. He is the first citizen of the Four Corners country, a fine American and a great man. I have mentioned before that it is in a common experience in the next-to-last frontier to think that one has got to a place where no white man had ever been before and then to find the initials J. W." John possessed not only a unsurpassed knowledge of the remote reaches of the region, but also the skills necessary to organize, outfit, and lead others on long treks into the terra incognito. According to archaeologist Neil Judd of the Smithsonian Institution, "John Wetherill was a determined man, especially on the trail. He improvised but never turned back; he always fought his way forward to his intended destination." Judd was a member of the 1909 Rainbow Bridge expedition. Another member of that party, government surveyor William Boone Douglass, recalled: "I never saw anyone who could get a party over as much ground in so short a time as he." From 1919 to 1930 Hosteen John guided New Yorker Charles Bernheimer on expeditions into through the Navajo Mountain country and the surrounding areas. On their first trip into unmapped territory, Bernheimer observed: "Mr. Wetherill is of course a genius and has a sixth sense which one riding behind him feels guides and directs him. He has not made a single mistake in his guidance of our party and is a thoroughly bred and highly educated man such as I rarely ever met. No subject seems strange to him, and in most of them he is a master." A few years later, after pioneering a new route to Rainbow Bridge, Bernheimer recorded in the register beneath the arch: "My chief thought at this time is that posterity may recognize and appreciate the ability of John Wetherill at finding and constructing the trail through Red Bud Pass which after 4 full days of labor yielded to his genius." Hosteen John's remarkable backcountry skills and the many discoveries that he participated in are only part of the story, however. The other legacy that can be found through the writings of his compatriots can best be described as a unique depth of character. Again quoting photographer Grace Hoover, "...we did not find him a 'rugged westerner' at all. He might rather have been one of our academicians were it not for a subtle quality that bespoke an induration grafted by harsh frontier living. John Wetherill has been cast in a mold at once gentle in outline and strong in singleness of purpose--of malleable but intrasigent stuff. One is mindful of his quiet force, while not forgetting the twinkle in his eye." Visitors to the Wetherill's' home were often struck by what would be called, in today's lingo, the "cultural diversity" represented there. Pioneer archaeologist Byron Cummings recalled: "We spent a happy Christmas as Oljato, enjoying the hospitality of the Wetherill's. For forty years their home was a haven to many a traveler and explorer in those regions. John and Mrs. Wetherill were friends of the Indians and of all white men who wandered into the Southwest on one quest or another. The doors of their home were never locked against any person, regardless of creed or color." Writer John Stewart MacClary noted: "Although his name perhaps will always be linked with the Rainbow Bridge, John Wetherill denies credit for its discovery. 'Nasja and Nasja-begay-the Pahutes-led us to Rainbow Bridge. The Indians found it long before the white men came.'" He concluded: "Mr. and Mrs. John Wetherill have been trail-blazers of courage and integrity on a frontier where there was a very great need for that type of character." During a harrowing boat trip up the ice-choked Colorado River in 1930 John's partner, Pat Flattum, observed: "John, with that never fading smile on his face, that signifies patience and great courage; in his presence one feels that there is something more in life than just mere joy of living, something more eternal." Although they had been doused in the icy water several times and lost all of their food in an upset, John recorded in his characteristic optimistic way when they arrived at Rainbow Bridge: "Had a wonderful trip through a country of much grandeur and beauty. I doubt if it can be surpassed anywhere else in the world. The hardships we went through only add value to a wonderful experience." Writer Robert Frothingham said: "you will like Wetherill-he is a real man, and as the Navajos said years ago (and Roosevelt confirmed later) he speaks with "a straight tongue." Finally, he is about the last of the Arizona pioneers, and he won't be here very much longer. When he's gone, the Arizona desert won't be quite the same." Erna Fergusson: "John Wetherill was a unique person, fine and gentle, and humorously wise. None of us who knew him will ever forget him nor know his like again." Randall Henderson, editor of Desert Magazine said: "In the heart of Hosteen John was more gentleness and greater courage than are often combined in one human."
. Grace Elwood Hoover, "Trespacsers in Mesa Land," Arizona Highways, June 1941: 5.
. Neil M. Judd, Men Met Along the Trail, 1968: 96.
. William Boone Douglass, letter to Louisa Wetherill, 19 Sept. 1909.
. Charles L. Bernheimer, field notes, 22 May 1920.
. Byron Cummings, Indians I Have Known, 1952: 12.
. John Stewart MacClary, "Trail-Blazer to Rainbow Bridge," Desert 1 (June 1938): 34.
. Pat M. Flattum in Ibid. : 41.
. John Wetherill in "Early Trip Up the Colorado from Lee's Ferry to Rainbow Bridge, January 1931," Plateau 34 (Oct. 1961): 43.
. Robert Frothingham, Trails Through the Golden West, 1932: 60.
. Erna Fergusson, quoted in Mary Apolline Comfort, Rainbow to Yesterday, 1980: 191.
. Randall Henderson, "Just Between You and Me," Desert 8 (Feb., 1945): 38.
. Neil M. Judd, Letter to Louisa Wetherill. Dec. 2, 1944. Fanny and Betty Wetherill, daughters of John and Louisa Wetherill. Photo courtesy of Harvey Leake, great grandson of John and Louisa Wetherill. Diary of an Arizona Pack trip of Wetherill and Chanler Expedition. The diary starts on September 28, 1933 and ends November 30, 1933, and gives a day-by-day account of a "Pack train of five heading for Apache Reservation country in the "White Mountains of Arizona" (Mesa Verde? ), to survey country inaccessible to the automobile." One of the participants was Ben Wetherill, grandson of John Wetherill. The diary is the property of Christopher Bach, Nephew of George E. Galvin, Jr.
John and Louisa Wetherill Photo Album. John Wetherill moved to the Chavez Trading Post in 1902-03 from the Ojo Alamo Trading Post leaving his partner Clyde Corville at Ojo Alamo to manage it. A drought forced the closure of both the Ojo Alamo and Chavez trading posts in 1904. John his family and Clyde Corville then moved to the Chaco Canyon Trading Post 1904 remaining there until 1906 when they moved to Oljato, Utah. 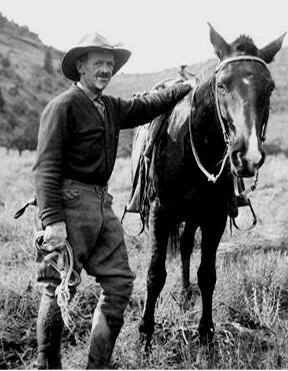 Photo of John Wetherill in 1931 at the age 65 in Glen Canyon, Arizona. He and and Patrick Flattum spent twenty-one days in a fifteen foot boat on a survey trip in connection with a movement to make the area around Rainbow Natural Bridge a National Park. John Wetherill and Flattum fought whirlpools, rapids and used dynamite to forge through ice jams. When no word was heard from them , newspaper headlines flared that the famous frontiersman was lost in the river.